It's important to realize that politics and advocacy are two different things. As you know, public libraries depend on millages, penal fines, state aid and myriad other sources of funding. What you may not realize is that for every dollar funneled into your library budget, someone advocated to see that funding was not taken away. The lobbying done by MLA, lobby firm GCSI, MLA Legislative Committee and numerous engaged librarians has resulted in increased state aid to libraries, relief from tax captures, continuing availability of the May, August or November ballot for library millage questions and the ability to communicate freely with your community. This fall we will be watching closely for any legislative initiatives that would impact library funding or assault free speech like SB 571 which would have prevented libraries and others from communicating with their patrons for 60 days prior to an election. Working directly with legislators and the administration to secure positive results is one way to advocate. But advocacy starts well before MLA and GCSI meet with a legislator in Lansing. It starts with educating and building relationships. Advocacy means educating key audiences on the value of libraries. 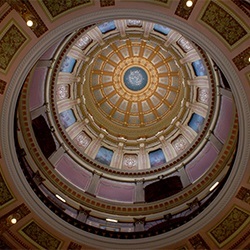 MLA brought the ALA Advocacy Bootcamp to a sold-out Lansing crowd in April. This training for library staff, trustees and friends focused on developing an advocacy plan for each library. It helped empower librarians with skills to tell their library's story and taught practical tips on how to be a respected and effective voice in the community - again this is all about building relationships. Local and state elected officials and community leaders need to be educated and reminded of the good work you do every single day. That's why advocacy is everyone's responsibility. Develop a relationship with your community leaders and elected officials and educate them. That is imperative. But don't stop there, tell your neighbor, your barista and the person who changes the oil in your car. It's all about community advocacy. What type of advocacy are you doing in your community this election year?